In his first article Liam Mullins discusses the recent visa-free travel granted to Georgian citizens in a number of European countries. 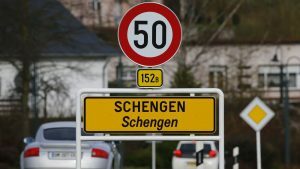 Thursday, February 2nd of this year, saw the European Parliament grant visa-free travel to all Georgian citizens within the the 26-country Schengen area. This milestone sees the broadening of our European border to the mystical land of Eurasia, and inevitably will act as a stepping-stone for Georgia in accessing the European market. As Ireland was precluded from the Schengen agreement, our tourism will of course remain unaffected. However – having befriended several Georgian students on my Erasmus year in Prague last year – I am ecstatic. This is indeed a fantastic opportunity for a post-Soviet country with a culture so rich and romantic, and a populace renowned for their hospitality. Perhaps Ryanair should be considering a new route to Tbilisi? But let’s not digress. I posed the above question to Oliko, a pal from my old Erasmus class who hails from Tbilisi. The impression I get from her is that her capital city is one which has managed to preserve its beauty and culture, as she describes the “narrow streets and old houses, famous baths… (and) holy mountain with its pantheon”. Her description of the Holy Trinity Cathedral of Tbilisi, also known as “Sameba”, which is among the biggest Orthodox Christian churches in Europe, invokes an image of a most extraordinary sight. Away from the capital, the country boasts vineyards, hiking trails and beautiful springs and lakes, all in the shadow of the intimidatingly spectacular Caucasus mountain range. Moscow spends millions of dollars on maintaining its information policies… Moscow’s propaganda machine works perfectly I think, because Russian TV channels are the most watched channels in today’s life in Georgia… Moreover, the attitude of the old generation towards Russia is more positive than the attitude towards EU (which is incomprehensible for me to be honest). Most of the people have the wrong imagination about life in the EU, even though they have never lived in EU… (they consider EU a big monster, which will steal the Georgian nationality and identity), but as I said Russian propaganda works perfectly and another reason is nostalgia of Soviet Union to current life… in the Soviet Union they lived a much better life. Life under communist rule was undoubtedly a simpler life for the older generation of Georgians. Of course, this is only in comparison with the Georgia in which they are currently growing old in – o ne which is still finding its feet, and will bit-by-bit endeavour to prosper and safeguard its citizens. A recurring theme from today’s global affairs seems to apply to the Georgian situation: the Russians are meddling. Sound familiar? For Georgians like Oliko, what lies ahead is both exciting and challenging. She explains how, for more than 15 years now, Georgia has been “trying to harmonise” in accordance with European values including human rights. Challenges include facing a stubbornly nostalgic older generation, who appear apprehensive at the idea of Europeanisation. As Oliko rightly puts it though: It’s not a case of “losing identity” – but moreso “developing” identity. The European Union espouses to safeguard culture and all those other things that make us uniquely different from each other. Georgia is proof that Europe is not a geographically restricted noun. In fact, it has taken on a more developed meaning. Europe is an inclusive community, not limited to the EU, where culture and diversity thrive in a land mass the size of the United States. So to all my Georgian friends, a very warm welcome to Europe!